Are you new to dance and you're not sure which style you like best? Did you miss our fall registration deadline? Do you want to explore other dance styles without committing to a full year? If you answered 'yes', then a MINI session is perfect for you!!! DU offers short, 6-week session programs which start in the Fall and Spring. 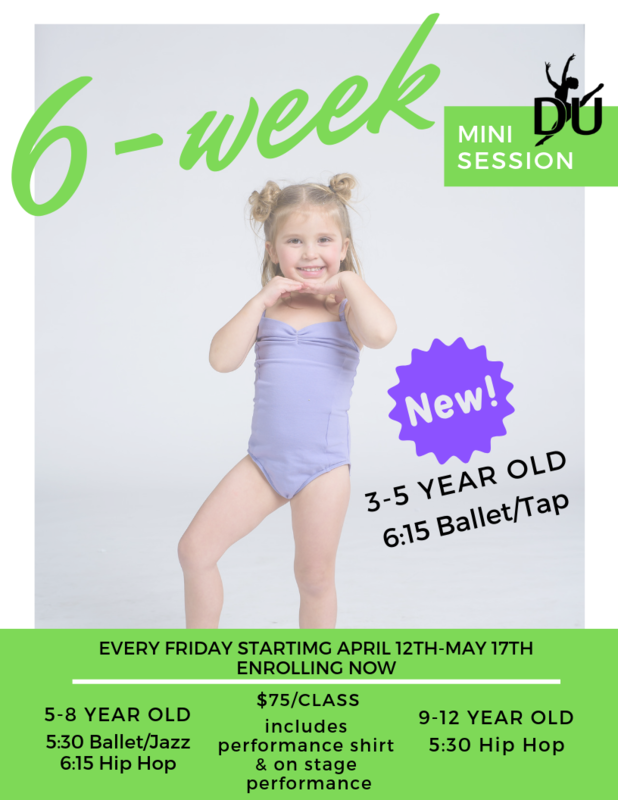 These programs are for dancers who want to try out different styles of dance. Parents, you can enroll for a mini session without a long term commitment. Mini session classes do not perform in our recitals but instead perform at their own, informal showcase the last class of the session. $75 tuition includes a performance t-shirt! Fill out the form below and we will contact you within 24 hours to add you to our list for enrollment.